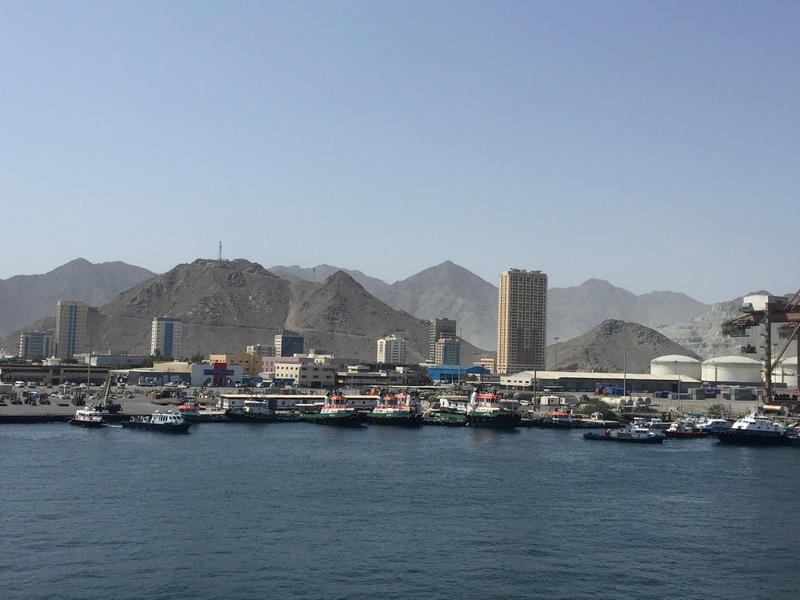 For a relatively small city, Fujairah has a busy port!. These small boats are out and back all day long. This shot is from our balcony. Fujairah is the smallest of the Emirates, composing only 1.5% of the UAE’s total area and it is the only one to front the Gulf of Oman. Today we took the shuttle bus to the city center which is 6 miles from the port. We spent the morning shopping and downloading stuff that takes too long on the ship. The city center is much smaller than Dubai and Abu Dhabi, but the American stores and fast food are all there! 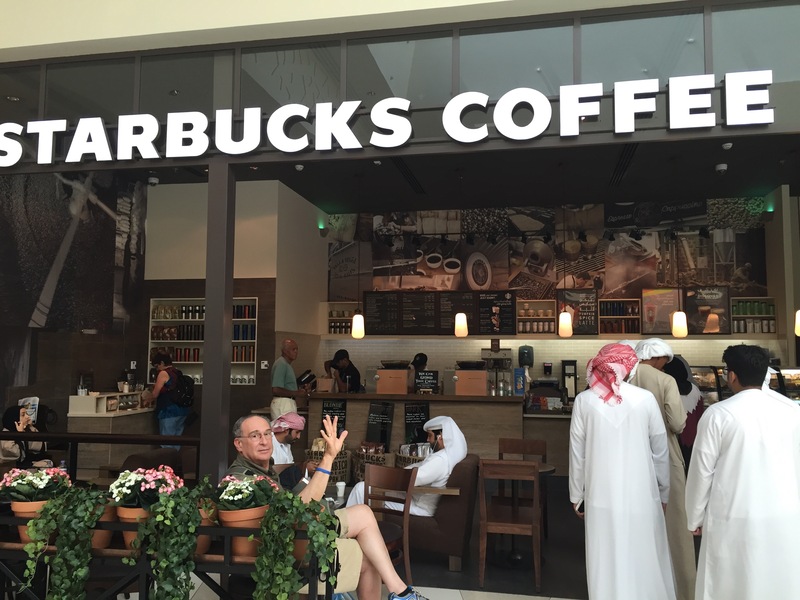 As you can see, Norm had a coffee at Starbucks! We bought dates, a specialty here, ibuprofen, which you can buy over the counter at 600 mg, three times the strength you get in the US, some local nuts and some sandals. Very hot again, but much drier. We did a bit of people watching and noticed the variety of robes worn by the women here. Some are very ornate and all of the women seemed to be carrying the most expensive and designer handbags! Some women have their entire faces covered and others have everything covered except the face, still others have just the head scarf. We are told that they do wear stylish clothing and expensive undergarments under the robes and we noticed all the fancy lingerie stores! Our ship security precautions are in effect again today for the next 10 days and we will have another drill so the new passengers know how to sit in the hallway floors! 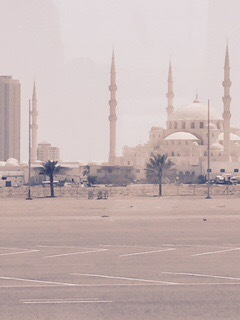 We passed a beautiful Mosque, the Sheikh Zayed Mosque, not a great picture, but good enough to highlight how magnificent it is. We had dinner with 2 new couples last night, one couple is in their 80’s and runs an antique business. You would NEVER guess their age. They are from Tennessee and are planning to retire in 5 years. Remarkable! The other couple is from Toronto. There are quite a few Canadians on the ship. 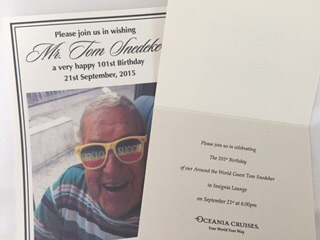 Speaking of age, today is Tom’s birthday (101) , and we got a party invitation for the world cruise travelers. Looking forward to celebrating with him! Doesn’t he look great? And, I realized we didn’t take a picture of ourselves at the gala dinner so I am waiting to get one from friends and will post when I get it. Now two more sea days until we get to India where we will tour Mumbai on Thursday and fly to Agra on Friday for 3 days to see the Taj Mahal. Stay tuned.. This entry was posted in Asia, September, World Cruise 1. Bookmark the permalink. Hi Pat & Norm. Very interesting. Can’t wait to see your post from India. Can you get snail mail?